The previous congress was in 2015, so 3 years have passed. What new and exciting revelations occurred in these 3 years? I can’t say that anything presented this year was completely revolutionary but a lot of research has been done expanding our basic understanding of fascia at both a cellular and physiological level . Of interest was the fact that researchers in medical silos far afield from fascia (from cancer to evolutionary biology) were present and presenting–fascia is finally being accepted and recognized as a critical component of understanding our bodies and health. It is challenging to see immediately the clinical implications of the basic research presented, but some very interesting studies and explanations certainly helped to deepen my understanding of what fascia is, and why it is. The following notes are from many presentations and plenary sessions, but I have not made an attempt to document the complete state of research nor summarize all the reports presented. Rather, I have compiled the reports that are of interest to me and ones that I feel may have a bearing on how we teach yoga asanas. Rhythym of Yoga host, Valencia Folks will be talking live with Bernie about yoga in general and Yin Yoga specifically. This will be a Facebook Live event in which you will be able to ask questions in real time. Don’t worry if you can’t make it for the live showing because it will be available for viewing aftewards as well. 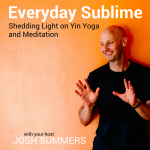 Josh has a series of podcasts called Everyday Sublime: Shedding Light on Yin Yoga and Meditation. In this first episode of a 4-part series, he welcomes Bernie Clark back to the podcast to discuss his new book, Your Spine, Your Yoga. In it, Bernie talks about the main themes in the book including the importance of stability over mobility in the health of our spines. Josh also asks Bernie to define some important terms that every yoga practitioner should be fluent with. They discuss the difference between stability and mobility, how best to train each, the differences between stress and stretch, as well as flexibility and mobility. As always, Bernie proves to be a treasure trove of knowledge and practical wisdom. The previous congress was in 2015, so 3 years have passed. What new and exciting revelations occurred in these 3 years? Rhythym of Yoga host, Valencia Folks will be talking live with Bernie about yoga in general and Yin Yoga specifically on Nov 27 at 7pm EST/4pm PST. Josh Summers and Bernie Clark discuss Bernie’s latest book Your Spine, Your Yoga.